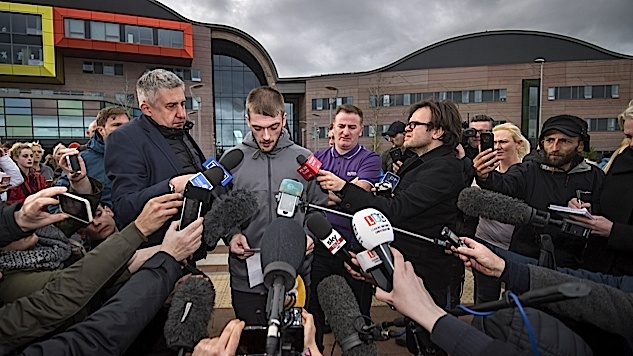 On Monday, the Italian government granted Alfie Evans citizenship, and the Roman hospital Bambino Gesu offered to treat the boy, even though Italian doctors agreed with the British diagnosis, and said the care would be palliative. Alfie's parents sought to transport him, but on Tuesday a High Court judge ruled out that course of action. He did open up the possibility of the child returning home, and in the meantime, on Monday night, Alfie was taken off ventilation at Alder Hey. As of this writing, he remains in Alder Hey and is breathing on his own. "Why does an American need an AR-15?" To make sure what's happening to #AlfieEvans never happens here. That's why. There's a lot to digest here, but it will come as no surprise that the conservative faction seem to be deliberately misunderstanding the facts of the case, and engaging in ugly opportunism designed to push an agenda. Which brings us to Dr. Dominic Pimenta, a junior doctor and writer who took to Twitter to help illuminate the subject for those getting caught up in the political squabbles. He offered the clearest and most concise insight into the specific medical facts of the case, and he did it all from the court record. His thread is so good, and so necessary in this instance, that we're including it in its entirety here in the hope that it will put the grandstanding of American political figures in its proper context.